Is ElkY Really That Bad of a Player? 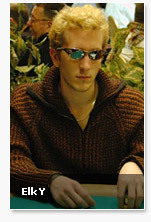 ElkY has been a hot topic on the poker message boards as of late, with most people talking about him with some derision. The subject of the scorn? ElkY's less than formidable Sharkscope stats, which show him as being down over $200k in SNG's. As someone who has closely following ElkY for years, I thought I would clear up a couple of things, as some people out there seem to think that ElkY is the worst player alive, and worse, than he receives his money from an inheritance or something. 1) ElkY is going for Supernova Elite status. The reason he plays so many $5k heads-ups on PokerStars? For SuperNova Elite. When he achieves Supernova elite, not only will he receive buyins to the WSOP, EPT Monte Carlo and WCOOP, but he will also start receiving FPP's at a much accelerated rate, which basically equates to a huge amount of rakeback for him. When you tabulate this, you will see that ElkY is in fact no really losing that much money playing these SNG's, because he is getting a lot back for doing this. 2) ElkY usually plays 12 tables at once. I will say that if Elky decides to one or two table, he would be one of the best players around. 3) He DESTROYS the $10 / $20 NL cash games on Stars. Don't believe me? I have hundreds of thousands of hands datamined. 4) He is a profitable MTT player. 5) Prior to coming in second at the EPT event, he had earned over $400k from playing poker online in the past year. 6) He took down a huge score at the EPT. 7) Do you honestly think that Elky believes he has a positive expectancy playing 4-5 $5k heads-up battles at once? No way.. it is all about the Supernova Elite. If you really think that ElkY is a weak player, then step up to the plate and battle him at the $10/$20 NL Tables on Stars, and see how you do.